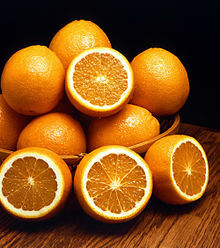 An oranger, in parteecular, the sweet oranger, is the citrus tree Citrus sinensis (Citrus aurantium L. var. dulcis L., or Citrus aurantium Risso an aw) an its fruit. The oranger is a mixter o auncient cultivatit oreegin, aiblins atween the pomelae (Citrus maxima) an the tangerine (Citrus reticulata). It is a wee flouerin tree growin tae aboot 10 m lang wi leafs that's aye green an sortit alternate, haes an ovate shape wi crenulate mairgins an is 4–10 cm lang. The oranger fruit is a hesperidium, a kynd o berry. Wikimedia Commons haes media relatit tae Citrus sinensis. This page wis last eeditit on 3 Julie 2013, at 05:01.